Highest Rated Chrysler Dealership In The Miami Valley! After working closely with a nationally renowned conversion van company, we have become the first dealer in the United States to offer a Ram ProMaster Conversion Van! Our goal was to create a top of the line conversion van, but at an affordable price. If you are interested in this van or if you would like to explore the possibilities of this new platform and have your own Custom Van built to your specifications, please contact us. The Sherry Van is available in a variety of floor plans and colors! We encourage you to visit the Sherry Vans Brochure website for detailed information about our conversion packages. The Sherry RAM ProMaster Mobility Van has more to offer than any other wheelchair-accessible van on the market! Per the request of the customer, we can customize a floor plan to make room for nearly any lift or additional equipment including hand controls, EZ Lock docking systems, transfer seats and more. ** The listed price includes all available discounts and rebates within the Great Lakes Business Center. Gross vehicle weight: 8;900 lbs. Here are some other vehicles that you might like. These our in-stock now! 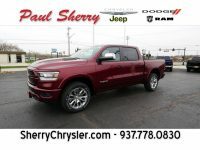 Sherry Chrysler Dodge Jeep RAM Used Cars is part of the Paul Sherry Family of Dealerships.